Part of the Northern Newfoundland Club, we train our dogs and enter tests for water rescue and draught (carting). We also do demonstrations for the public and we do lots of fundraising events, especially around Christmas. 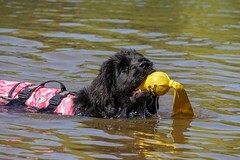 We have been training Newfoundlands for over 25 years. We are a friendly group and welcome all Newfoundland owners to join RVTG. In the Spring and Summer, we train in water rescue every Sunday apart from when we have tests and events. We usually train at the Northern Lake at Rother Valley Country Park, though we do occasionally train at other venues. In Autumn and Winter we train most Sundays in venues across South Yorkshire. For details of where we are training, please consult our facebook page. Newcomers are more than welcome to join us for a couple of taster sessions, but in order to join the group after these sessions you must be a member of the Northern Newfoundland Club. You can find details about membership on the NNC webpage. 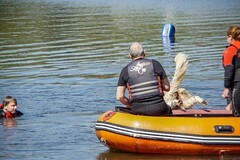 Most o f our members train for the NNC tests in water and draught, as it is a great feeling to work hard with your dog towards a recognised achievement. However, we welcome all members whether they choose to test their dog or not. As a member of RVTG, you can attend once a year, once a month or every week; all we ask is that when you do attend you help us to set up, pack away and to train other dogs, as other members will also help you! We have members of all ages and we are family-friendly – children will be helped to be junior handlers! Unfortunately we can only accept Newfoundlands for our training, though if you own another breed of dog in addition to your Newfy you can of course bring them along. See the ‘contact us’ page to get in touch! RVTG is very kindly sponsored by Maris Pumps.